We’ve talked rather a lot in recent weeks about building up the basics in a wardrobe, but less about the statement or accent pieces that can set an outfit apart. This is because statement pieces are so much harder to get right. They exist outside the normal rules, or customs, and indeed often become statements because they subvert those rules. The key is to subvert just one thing: take a classic piece of clothing and switch its colour or texture, keeping everything else the same. My favourite statement item is a pair of bright red shoes. I used to know an Italian lawyer who wore these wonderfully. Everything else would always be strictly conservative: navy suit, white shirt, dark tie. But bright red brogues. Often statement pieces require this kind of conservatism elsewhere. I have a pair of red whole-cuts from JM Weston that perform this role (similar model, above). Lovely shoes, well maintained and polished, worn with the simplest of suit/shirt/tie combinations. Few other bright colours work for shoes. Green, blue, yellow – none of them work with a navy suit unless much darker and so subtler. Second, the black suede shoe. Where the red shoe introduces an unexpected colour, this is an unexpected texture. Black suede stops the eye dead as it runs over the outfit. Suede absorbs the light where you expect it to reflect. Again, keep it simple elsewhere. Cary Grant, predictably, was a master of this. Third, the cream waistcoat or sleeveless sweater. Sweater is perhaps safest for those experimenting for the first time. For a neutral colour, cream makes an outfit look remarkably dressy – probably because of the associations with cream and pastel-coloured waistcoats with formal daywear. Because it is so dressy, keep the rest simple still. I like grey flannel myself, with a white shirt. Other statement accessories are lime green ties (with blue shirt and navy suit) or indeed pastel colours. Ties are particularly difficult to pull of as accents, so make sure to keep the quality high and the patterns simple. Handkerchiefs are a safer bet – ones that go with nothing obvious in the rest of the outfit. I like pink with grey flannel, green or purple with navy worsted. Have a try once every other area of the wardrobe is covered. But remember: just subvert one aspect, whether colour or texture. Woollen ties with woollen suits work well for similar reasons: it’s exactly what the rules tell you not to do. You can follow the discussion on The statement piece by entering your email address in the box below. You will then receive an email every time a new comment is added. These will also contain a link to a page where you can stop the alerts, and remove all of your related data from the site. Those shoes are a lovely colour. I don’t know if it’s a conscious change of some kind but the last few articles have been really great. Specifically I’ve found them to be useful on any budget. I’ve been doing the sort of things in this article for a while without really knowing why, so this is helpful to make sure I’m not overdoing it. I have a friend who subverts as many aspects of every outfit as possible in this way. It’s not good. Thanks Richard. Yes, I am making a more deliberate effort to write one piece a week that is more practical. The reason I tended not to is that I have written about similar things before, but then not everyone has been reading for five years I suppose! I always think a really nice accent piece is a simple boutonniere (ie without loads of foliage like you’d wear at a wedding). I live near a florist so quite often I’ll pop in and grab a carnation or something in a complementary colour. It somehow looks dressy but informal at the same time. And it’s as rare as a pocket square used to be. I was wondering today what you would be writing on. Again to my great surprise, this post appear to be of very high interest! Indeed, I personally do like your subtle way of introducing the subverting element into overall outfits. Yet your point in this post as in many others is premised on a good knowledge of the rules! Isn’t it? As many other readers, I presume that from time to time I have been unwittingly surberting rules! And to be honest, I have never paid any attention to those rules. Not for the sake of personal style I intent to break them, no, but simply because – the crude distinction between formal & casual wear aside – I do not know what those rules are to start with! Would it be burdensome to recall each time what these damn rules are? Those shoes in the photo don’t really look ‘bright’ red. If I was told someone’s shoes were bright red I’d be expecting something more like a pillar box than a Beaujolais wine. Not that I don’t find those shoes striking. It’s true what you say about cream a waistcoat/sleeveless pullover making an outfit look ‘dressier’ and I used to shy away from it because I thought it looked too affected, but it’s actually quite marvellous. I am after both of these unicorn shoes. -Black suede: Have only found overstyled Italians or out of reach MTO so far, any suggestions? John, I personally believe that all the rules are worth knowing and understanding. There is a lot of wisdom in them. See my series on this site, The Rules and How to Break Them. Roger, you’re right the colouration of the shoes is a little misleading. Not that they aren’t lovely, as a more conservative option. But I was referring to pillar-box red. Anonymous – I’ve only found good black suede as MTO as well. Many thanks, Simon. Indeed, I have just seen them and read. Now having these posts in mind, I wonder whether a true – and necessarily bold – “statement” doesn’t occur when an outfit has already been somehow subverted, and then appears against that background as a kind of signature of a master. I say this for a simple reason: we spend most of the time breaking rules unwittingly or not. 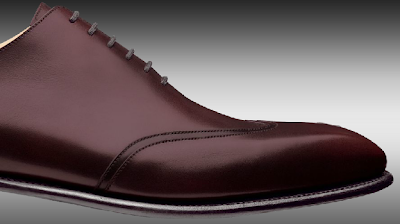 Personally I prefer brown shoes, but I am very intrigued in a pair of burgundy/ dark red shoes. Especially burgundy loafers looks perfectly with a pair of jeans and an odd jacket. Even though the whole idea of a statement piece is that it stands out from the rest; there are better options than others when it comes to acquiring the first few (if you actually intend to get some use out of them). For shoes this can be often achieved with taking a classic piece and changing the leather to something exotic. My go-to statement pair of shoes is a pair of gray CJ ostrich loafers. Works with corduroy, cotton, jeans and with most colours; yet it gives a twist to every look. In your 11 SEPTEMBER 2008 blog “Step by step: The odd waistcoat” you basically agreed that a lightly colored. such as buff, waistcoat is “dandified in the extreme” and the odd waistcoat must be dark. Here you recommend cream. Care to elaborate ? Perhaps I’ve come around slightly to cream or pale waistcoats in the intervening years. But the description still stands and I recommend a sleeveless sweater first – I own one, but not a cream waistcoat at the moment. I think your blog is excellent. I’m interested and heartened that there is a cohort of men taking style so seriously but enjoying it as well. I agree that getting the look just right but then to subvert it in a small way, which may only be noticed by a few percent of the population, adds to fun. I have a question. Can I have a recommendation for a tailor to make a bespoke suit for around £1800. I know it probably prices me out of the row but is there anyone giving the next best thing?